Dr. Steve Purdy, professor of veterinary medicine at the University of Massachusetts, is busy teaching the next generation of camelid vets who will help us managing our herds. He is working on a vaccine for camelids. According to Purdy, he states that wherever white-tail deer exist, most of the northeast, the deer are infected with the meningeal worm. Paralysis or death occurs to the infected animals. So weakness in a hind leg or lameness would be a sign of infections. Joan Burke, USDA Ph.D., fellow GALA presenter, mentioned that sheep and goats in the southeast are also affected with the disease. 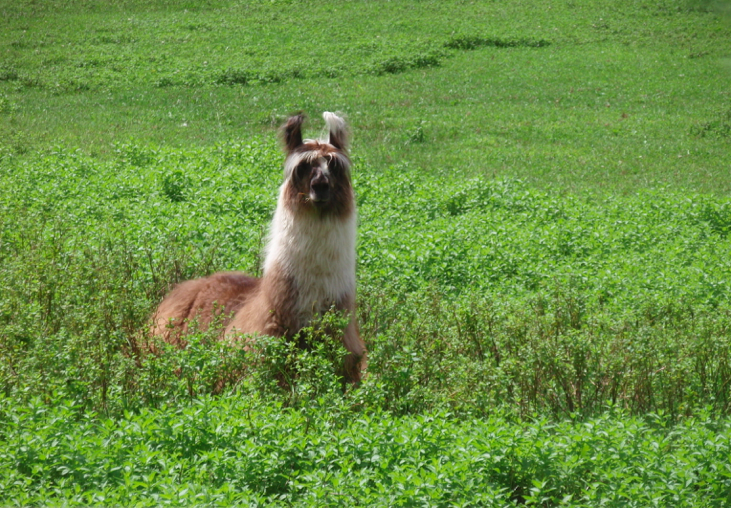 It becomes important to protect our guard llamas from the diseases that goats and sheep may carry. Our largest protection, however, is keeping llamas and alpacas from deer feces where the slugs reside. So we need infected manure, a slug on top of the manure pile, and the larvae burrows in, and in 30 days we have the infectious stage. 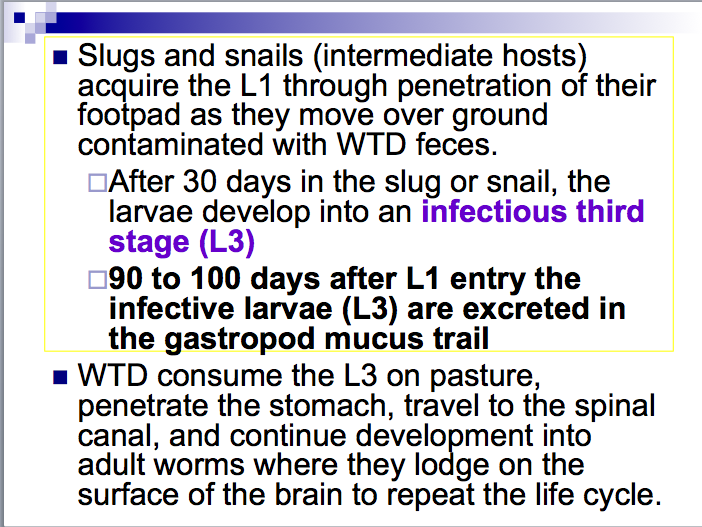 90 to 100 days later, the larvae are secreted in the mucus trail, where they lodge on the surface of the brain to repeat the life cycle. Purdy believes it is the mucus trail that contaminates and infects our animals, which also live on host plants that our animals consume. Wet conditions will also increase our animals’ high risk. 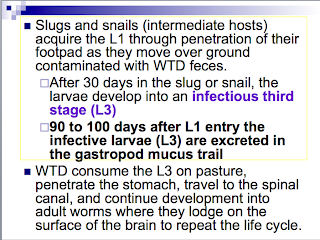 Several species of slugs and snails carry the meningeal worm disease. 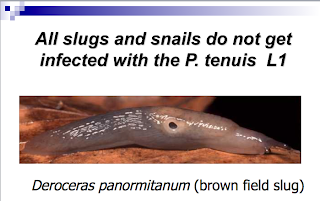 For our animals to get a disease with infected grass with slugs and snails—there must be thousands. Deer, once infected, do not become reinfected. They become exposed, get the parasite, their bodies develop an immune system, and the deer rejects reinfection. 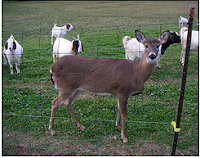 This becomes a type of vaccination in the deer’s immune system. Wet areas, downed trees, leaves, branches, and trees (upright) are hosts for these gastropods (slugs). They are infected by the L1 while moving over deer piles, and then mature to the final stage. In deer, the worm moves within 30 days to the brain. In the aberrant host, camelids, the slug does not always infect the whole herd, just usually one animal. Keep your animals away from streams and ponds. 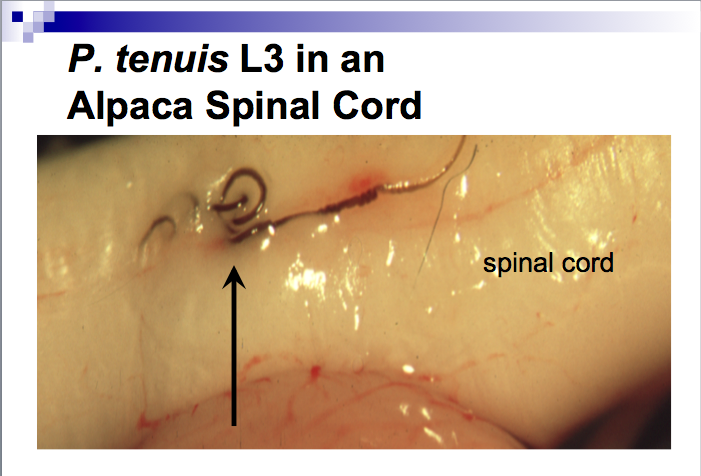 Depending on where the parasite goes, it makes holes in the spinal cord or brain. 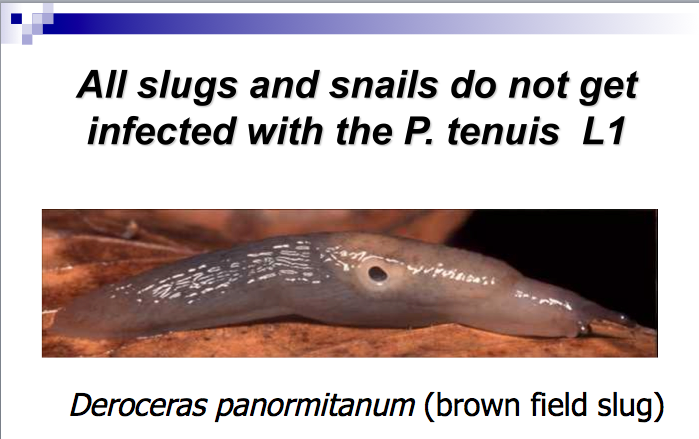 These infestations occur all year round, and immune systems among animals make the difference between infection or not. Purdy says the mucus left behind causes the infection. Can baled hay create an infection? Purdy says he does not know. Lameness, mild or to acute paralysis, and blindness are signs of the Meningeal worm disease. Diagnostic testing is a blood sample for elevated levels of eosinophic white blood cells in the spinal fluid from a CSF tap. 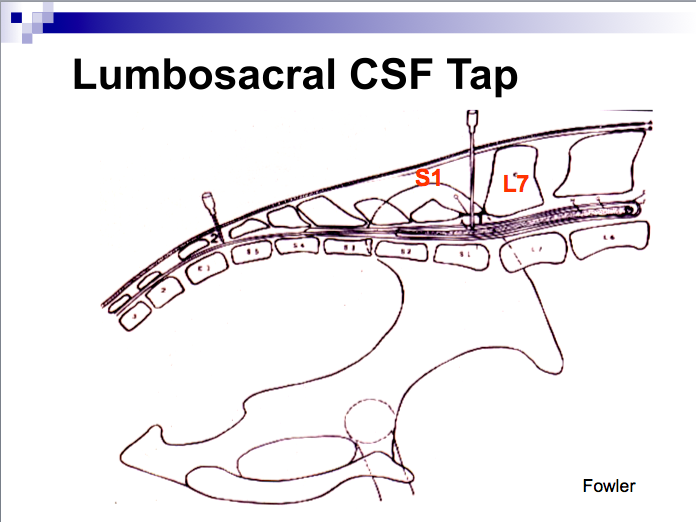 CSF can be stored for days in EDTA tubes before analysis as long as it is refrigerated. It is not a hard sample for your vet to get and it is bogus when people tell you the sample must be obtained and sent immediately. Just not true. Even before you find the results of the test, Purdy advises you to begin to treat the animal, because it could die. So, hit him with everything to get his nervous system back because the disease progresses QUICKLY. 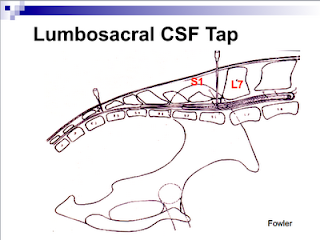 CSF tap will likely cost $150 – $200 dollars, without adding treatment. But considering an animal could die in 5 days, so early aggressive treatment is what you want to do. IDEXX labs near Tufts University is a place to send the blood work. 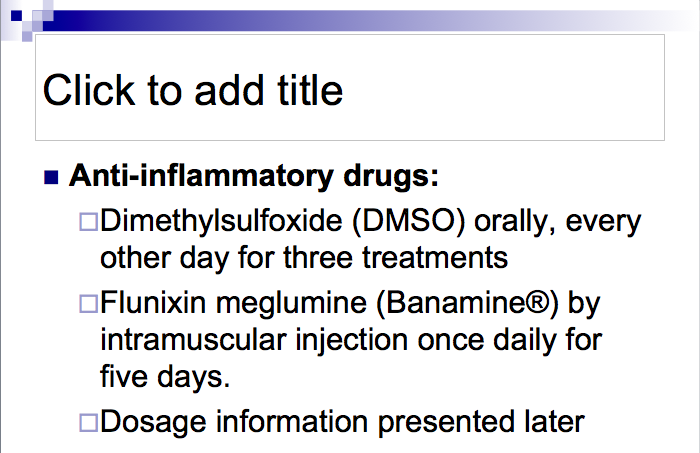 Anti-inflammatory drugs: DMSI orally every other day for 3 treatments; flunixin meglumine (Banamine) by intramuscular injection once dail for 5 days. Dosage is included in binder as well as in the digital copies below. Anti-parasitic drugs: ivermectin by subcutaneous injection every other day for 3 treatments; fenbendazole (Panacure or Safeguard) past orally once daily for 5 days. Chiropractic and acupuncture is also an alternative and Purdy says all the people he’s sent to them have had good result. A pregnant llama is a high risk if it has a neurological disease. Recovered animals have some neurologic deficit, and that may include weakness and lack of coordination. 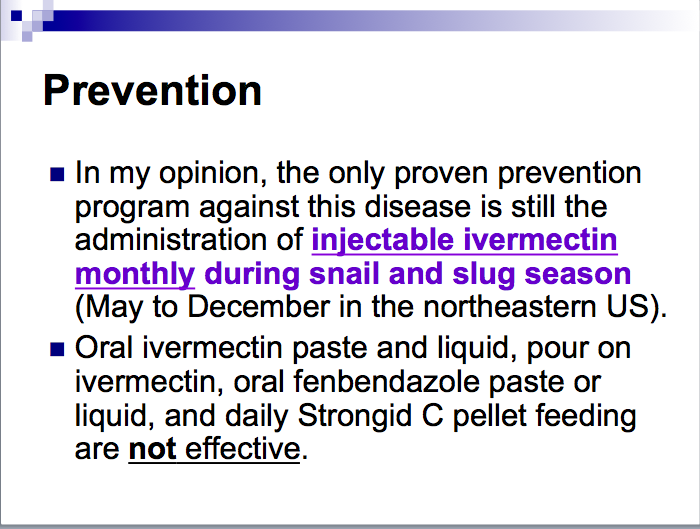 Prevention: monthly doses of injectable ivermectin during snail and slug season—May to December in the northeastern US. 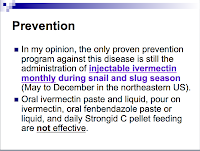 Oral ivermectin paste and liquid…are not effective. 4 mls per 100 pounds body weight for treatment. Please peruse Dr. Purdy's PowerPoint presentation that he so very graciously shared. 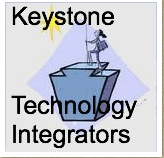 I have included all of his GALA 2010 presentations below, although this was the only one I had the opportunity to attend and blog. Neonatology is presented separately since the file was to large to upload in box.net. We live in an area where only mule deer inhabit, but our female is exhibiting similar symptoms...any suggestions???? Our vet is not sure but does seem to think it is neurological.